Yes, designed especially for us, high mobility individuals who travel a lot or like to work outside the office and NEED to get the paperwork done without the fuss; Office 365 Personal is now available in store with very affordable price. The IDR 71,999* package includes ALL seven Microsoft Office daily heroes: Word, Excel, OneNote, PowerPoint, Outlook, Access and Publisher. 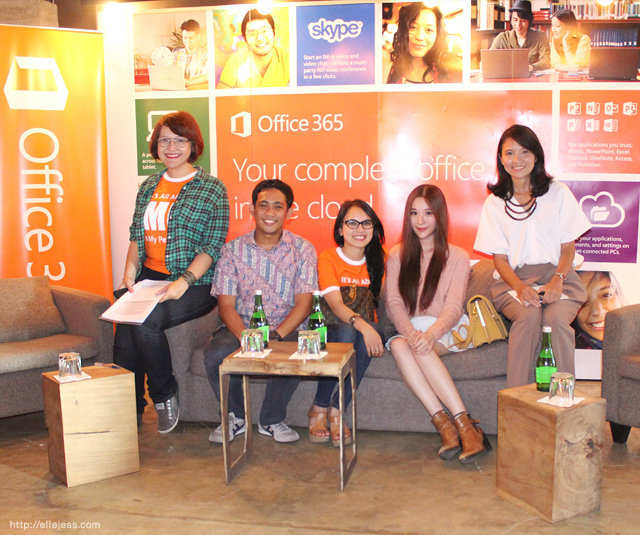 So anyway, few weeks ago I was invited to Office 365 Personal launching event at Crematology Coffee Roasters, Jakarta. I was also being asked to be one of their key opinion leader (KOL), together with Arif Rahman, a very famous yet friendly Indonesian travel blogger; sharing our opinions about the product on public. Being a loyal user of Ms Office (as I mentioned before ^^), I eagerly joined the opportunity and became one of the first few lucky peeps to own and try out this awesome product! From my experience using Office 365 Personal, I gotta say that the feature I like the most is the synchronized data that allows me to use across devices. Well anyway, imagine if I had this Office 365 Personal already then, I wouldn’t have to go through all those troubles! I’d just do it all on my phone and send it in a jiffy. Wait, I wouldn’t even HAVE to send it because it automatically syncs with my PC back home (okay, my assistant doesn’t have the access to my computer but I can always ask my brother to copy the file and give it to her ^^)! Saves a lot more time and energy, huh? Whoaa! You look great Jess! Jess ternyata pencinta teknologi juga, microsoft makin cool ya! i couldnt imagine myself without Microsoft either, love their new concept! Your opinions are quite interesting, I enjoy reading what you write.